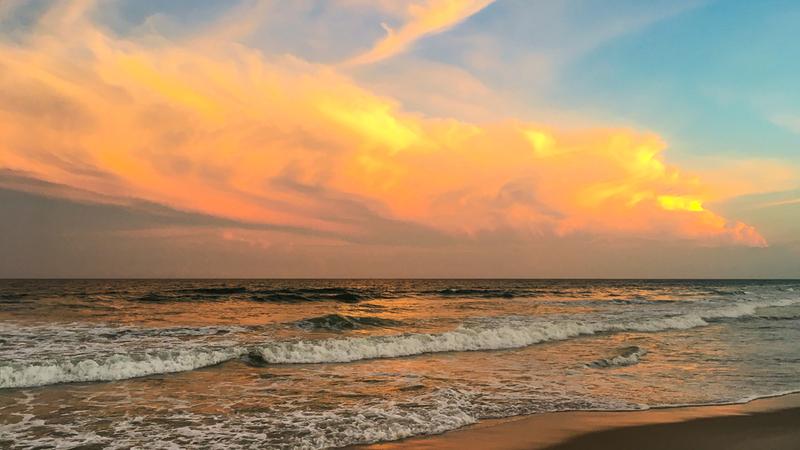 There’s an island off the coast of North Carolina called Topsail Island. Since I was a kid, my (Mr. Fool’s) family has loved to visit. It’s a small town with a leisurely vibe and clean beaches that are scattered with seashells and sharks’ teeth. Perfect for a family vacation. We rented a beach house that was practically right on the water: walk down the steps off the back porch, and your toes were in the sand. Our days were spent sleeping in late, playing in the warm surf of the North Atlantic Ocean all afternoon, and walking the beaches at dusk to take in the amazing sunsets. 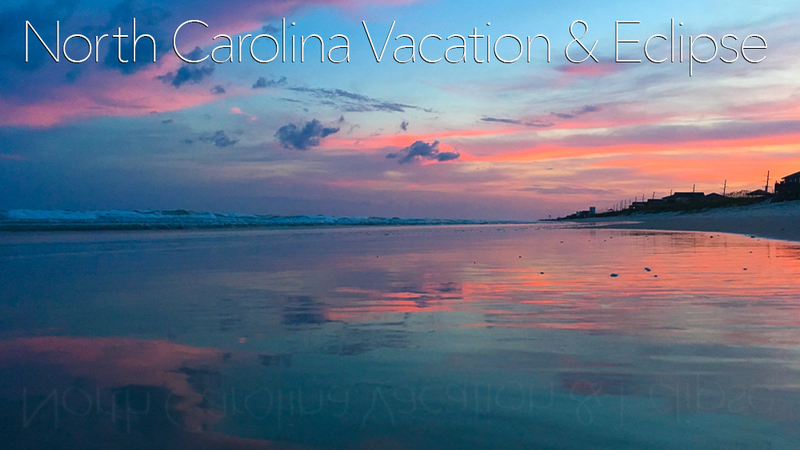 Drinking in a beautiful North Carolina sunset while we walked along the beach. I brought my drone (DJI Mavic Pro) and flew it a few times while we were there. It handled the high winds decently well and even got a little rain on it one time. Check out the short video below. It so happened that the 2017 total solar eclipse was happening during our vacation. Since we were only a few hours from a path in the totality, on the day of, Ms. Fool and I woke up early and drove to Turbeville, SC. It’ a small town away from major cities, so we figured there would be less traffic. It was cloudy for long parts of the drive, and we were worried we wouldn’t be able to see much. But, as luck would have it, the sun was no longer hidden by the time we finished driving. A few minutes before the totality, I flew my drone up and let it hover to capture the moon’s shadow crossing over the earth. I got some cool footage you can see below. Watch the lower part of the screen: you can see the street lights lining the road all come on. For fellow drone enthusiasts: I rotated the drone 180 as the shadow passed. The result: it looks like I just graded the footage dark to light. On the last day of our trip, we had a few hours to kill on our way to the airport. We stopped by the U.S.S. 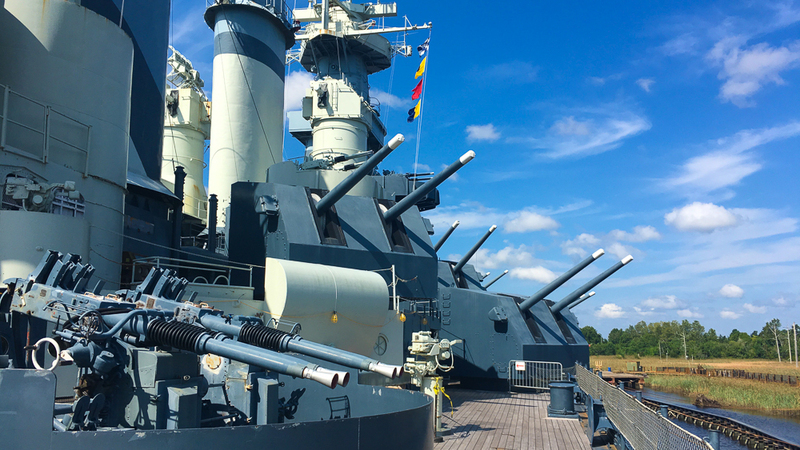 North Carolina Battleship Memorial to check it out. Entrance to the U.S.S. 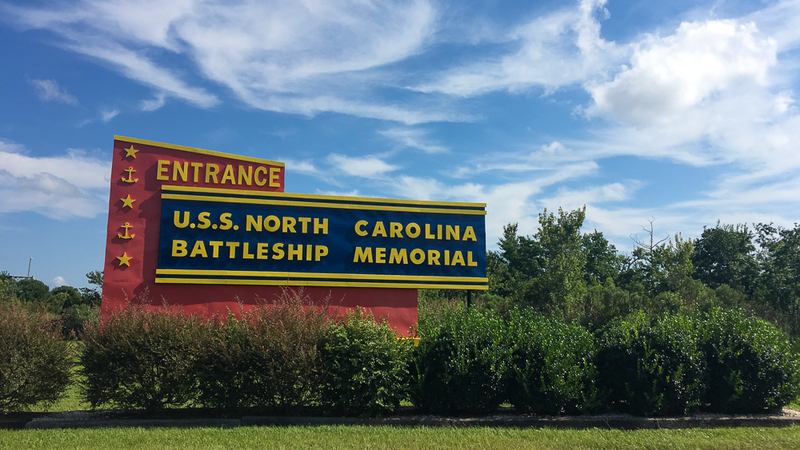 North Carolina Battleship Memorial. We wandered around the decks and crawled inside a turret where there was hardly space to move. The living spaces below deck were hot and small. It’s incredible to think about what our enlisted endured. Wandering around the deck of the U.S.S. North Carolina. You could easily spend more than a few hours on the ship reading all the exhibits and following their audio tour. But it’s also nice to take a quick self-guided tour, as we did.